The weekly AAII survey of retail investor sentiment shows little change. The bulls decreased slightly to 35% and the bears inched higher by a smidgen to 36.7%. Basically that puts us squarely in neutral territory which is a bit surprising since I expected a bigger reaction from this indicator to the break down in the S&P 500. Perhaps next week when Friday’s back to back decline is taken into account we’ll see this sentiment measure actually move to a level showing real worry. But we’re not there yet. I’ve mentioned the asset allocation side of the AAII survey a few times before and how it has provided insight into major inflection points. 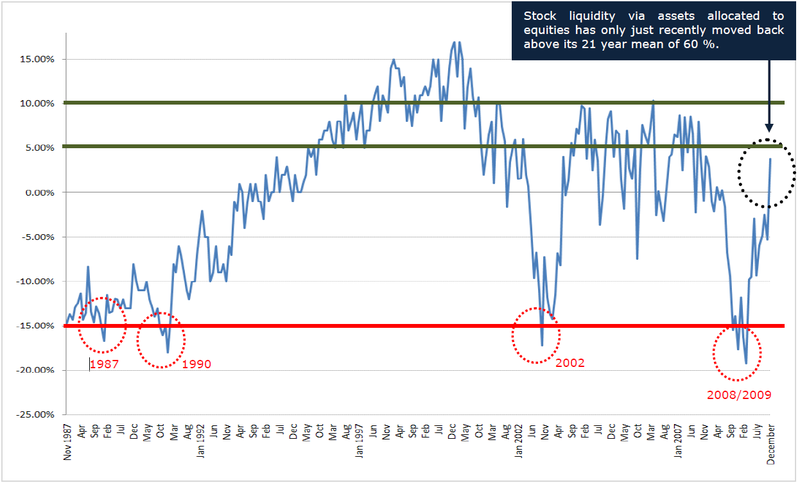 Currently we are seeing the retail US investor continue to allocate more of their portfolio to equities. They are approaching but not yet overtaking the extremes that we saw at the bear market top in 2007. The chart below shows the total history of assets allocated to the stock market by AAII members. The previous chart from last week’s webinar with Jason Goepfert showed the nominal levels along with cash allocation levels. This week there were 52.2% bulls and 18.9% bears. Those expecting a correction decreased slightly to 28.9%. But this tenacious bullish streak may simply be due to the timing. When the survey was taken (Wednesday) the stock market was still trading down but still nestled in a comfortable trading range. That changed with the two back to back wide range down days on Thursday and Friday. Interestingly enough, we again followed the pattern from last week where the first half of the was mild and the fireworks arrived on Thursday and Friday. In any case, the usually bullish newsletter editor is definitely unnerved. The Investors Intelligence poll found the bulls declining from 52.2% to 40% and the bears, still at a relatively subdued level, rising from 18.9% to 23.2%. The dramatic decline of bullish sentiment is one of the largest for this indicator. And as Jason hints on his blog, it isn’t at all good news for the bears. The third option, as you know, is not “neutral” but “correction” for the II poll. And this unorthodox crowd surged to 36.7% - a 23 year record! Interestingly enough, while extremes of bulls and bears have been a good contrarian indicator, large correction levels have also been very good gauges (but not in a contrarian sense). While not strictly a sentiment indicator, the ratio of aggregate cash held by mutual funds is a useful market timing tool. It does generally reflect the performance anxiety of professional money managers and their herding instinct. So in a sense, we do get a sense of the mindset of the average mutual fund manager. Of course, this also reflects the incentives provided by the monetary policy in relation to cash. You can read more about an analysis of that in our previous discussion (Mutual Fund Cash Levels Adjusted For Inflation). Right now of course, there is absolutely no incentive to hold cash since rates are basically zero. Except if you count deflation. 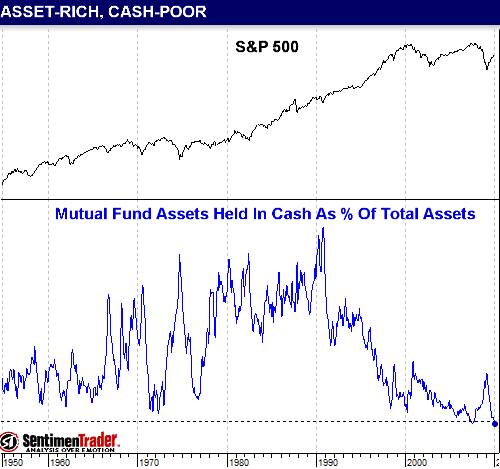 In aggregate, mutual funds as a group are holding an alarmingly small amount of cash reserves. The only other time they held less was in late 2007. I don’t peddle in bombastic prophecies but among other things, this means that if we do see a cascading decline (or dare I say it? crash) then mutual fund redemptions will cause a vicious cycle where they sell to meet their client’s request for cash only to create more of a panic and more redemptions. Option sentiment indicators were one set of metrics which have been flashing bright red for a long time. The market ignored them completely as it merrily climbed a steep hill. Finally we’re seeing a decrease in enthusiasm from option traders. But even though this week’s option sentiment indices fell just as steeply as they were rising in the previous weeks, we are still not even close to levels of despondency. The CBOE put call ratio (equity only) rose sharply to 0.67 where we’ve seen it last in mid-July and mid-June 2009. While it is natural to see the penchant for call options decrease we have yet to see a panic rush to buy insurance (puts). Unlike the ISE option ratio (see below) the daily CBOE put call ratio followed a ‘normal’ course where it tracked the decline in the market. The 10 day moving average of the ISE call put ratio (equity only) fell to 166. 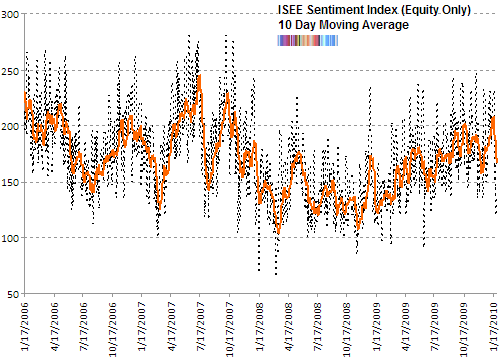 The last time the ISE sentiment indicator was this low was in early September 2009. But that isn’t saying much because as you can see in the chart, it has been much, much lower. Also interesting, while the end of the week brought us the break down in prices, it was on Monday when the ISE daily index reached its lowest point since July 9th 2009. In the first day of the trading week there were only 121 calls traded for each 100 puts traded on the ISE options exchange. In contrast, when the S&P 500 was breaking down on Thursday and Friday, we had the relatively high readings of 165 and 172, respectively. Hopping the pond over to the old world, German business confidence as measured by the Ifo Institute shows a robust economy. 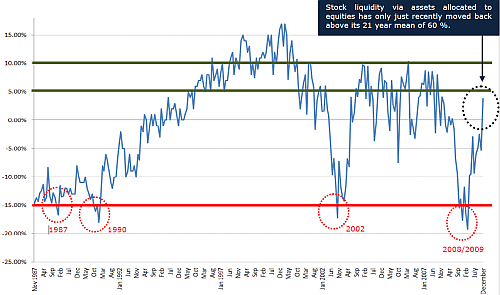 After reaching a 26 year low of 82.2 in March 2009 it is now at 95.7. German businesses are enjoying a healthy demand for their products from Asia and riding on the coat tails of a weaker Euro. For further details see the recent Bloomberg article here. Clarification re. Jason’s blog post on the large decline in bullish sentiment, he hints this is not good news for BULLS. Dave, in the webinar Jason mentioned that even though he presents quite a few contrarian indicators of sentiment which have a bearish interpretation, he did not believe that we have the conditions for a “significant top”.